I made chicken empanadas this weekend because it seemed like a good idea and like a good way to say goodbye, even if it’s only a temporary goodbye. A chicken filling full of love, hugged by a flaky crust. Tears optional. Lime juice recommended. Our friends are moving. To Scotland. Scotland seems awfully far away from Minnesota. So, as I sat here last week contemplating the length of 12 months and what on earth I would do without Jen at happy hour and Halloween and New Year’s Eve and all those days in between and tried to determine how I could possibly justify trekking over a giant body of water – maybe to bring you all a haggis recipe, perhaps – I asked Matt and Jen if I could possibly bring them dinner this past weekend. They agreed. This is the dough blade on my food processor. It makes doughs like this one easy and fuss-free. My favorite parts about this particular dough adapted from Laylita are that it comes together easily and is easy to work with once it is together. Start with flour. Add in one whole egg and some cold water and pulse until it comes together. When it’s nice and crumbly, we’re done. 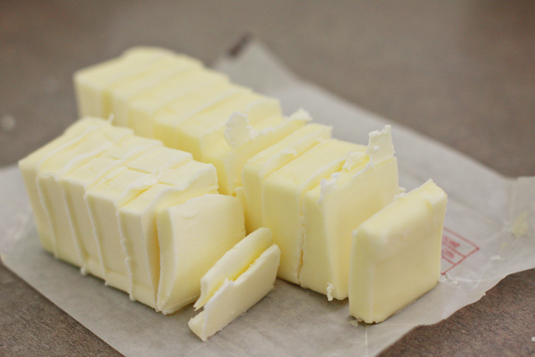 Keep in mind that you do want a few chunks of butter in there. We aren’t looking for uniform texture. 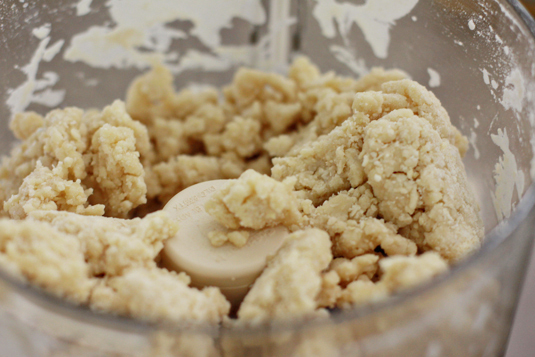 Those chunks will make the dough flaky later. 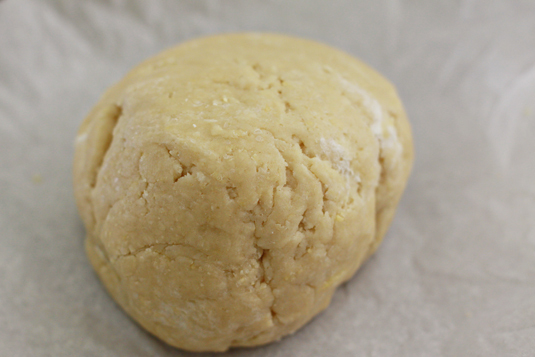 Form a ball shape and stash it in the fridge to rest while you make your filling. 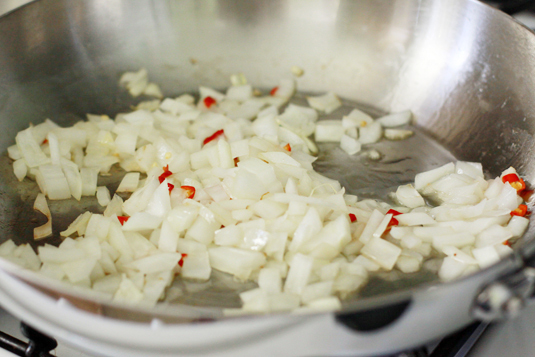 Toss a few diced onions and two to three chilies into a pan with a bit of heated oil. 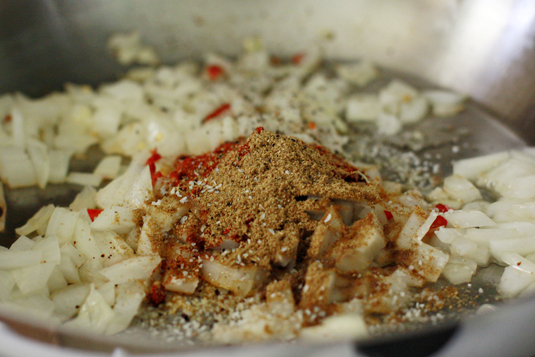 … and cook it down until the onions are tender. 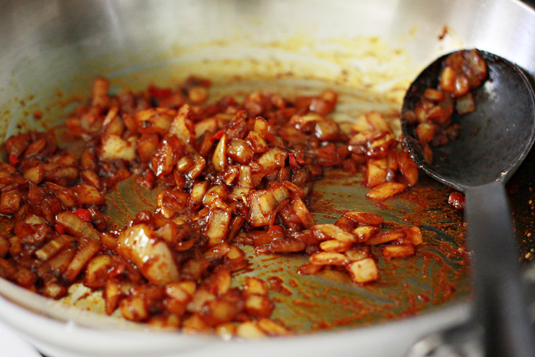 This is where I want to try it because it suddenly looks all hot and spicy. 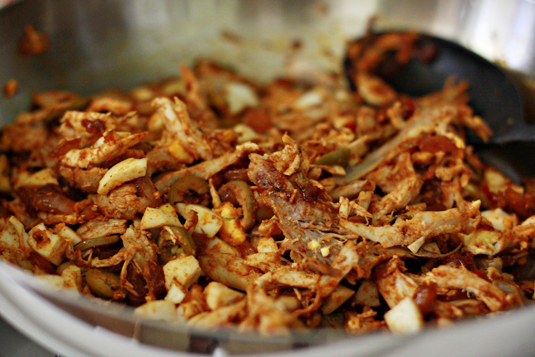 To our onion, sauce-like mixture we will add shredded chicken. 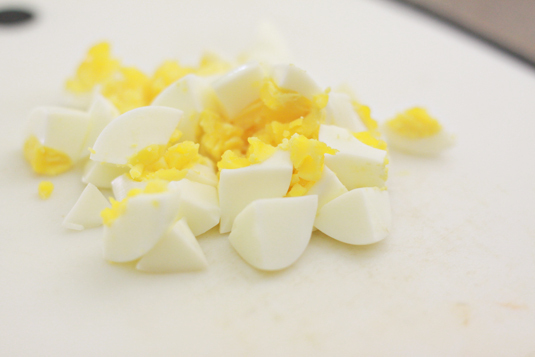 Hard-boiled eggs. The Argentinean recipe told me so. I can’t argue. 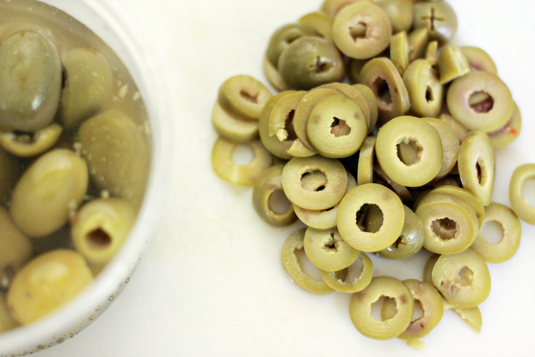 Mix it all together, and we’re ready to stuff. Start by rolling out your dough. I like the uniformity of rolling out large sheets of dough and cutting them with a cookie cutter or a round lid or container. Place a small amount of filling in each circle. These circles are about 4-5 inches across, and I used 2-3 tablespoons. You want to leave a decent edge around the sides to seal and fold to prevent anything from spilling out. 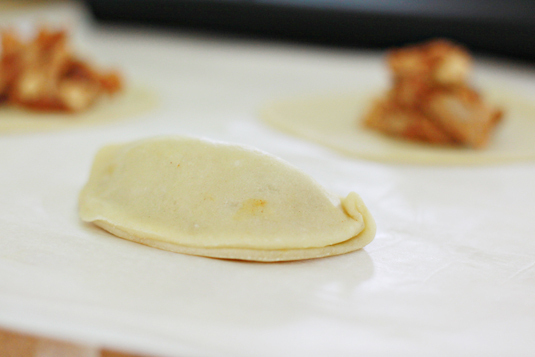 Fold the empanada in half and press to seal. You can roll over here and press with a fork, or you can just seal with a fork. For mine, I rolled the chicken empanadas over, and then because I was making caramel bourbon peach pies from the dough as well, I simply pressed those with a fork so they would look different and I could tell them apart. Not pictured because I was melting in the heat of Matt and Jen’s kitchen: Beat an egg yolk and brush it on before baking so your empanadas get a brown glossy look across the top. 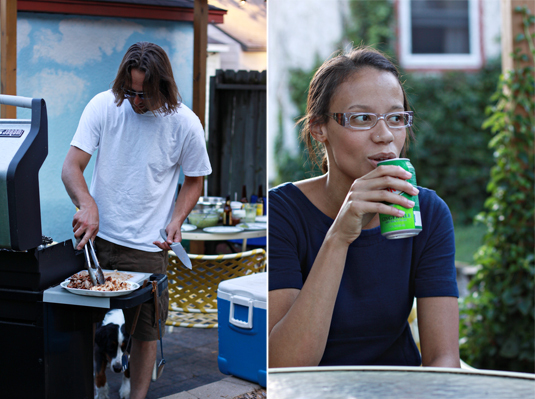 While my empanadas baked in the house, Ole stayed outside and grilled steak and chicken fajitas and the rest of us sat around and pretended that no one was leaving, that we’d all be there again or perhaps at Kevin and Leslie’s house or in my own dining room, that summer would last forever. And when dinner was ready, we ate outside in the cooling summer evening, silent. I’m not sure if they were silent because they liked the food or because we knew it wouldn’t last, despite the fact that we’d bid the Sno’Laughlins farewell earlier this month already and here we were again, trying to extend the time before the inevitable parting. And after we ate, well, Matt invited us out to one last farewell dinner the night before they depart. That was last night. The final goodbye. And here we are, at the end of summer and the beginning of a year of emails and Skype calls. From there, all that’s left is to say hello again in 12 months. That is, unless I can weasel my way to Scotland before then. We’ll miss you both! In fact, I miss you already. Have a fantastic time! 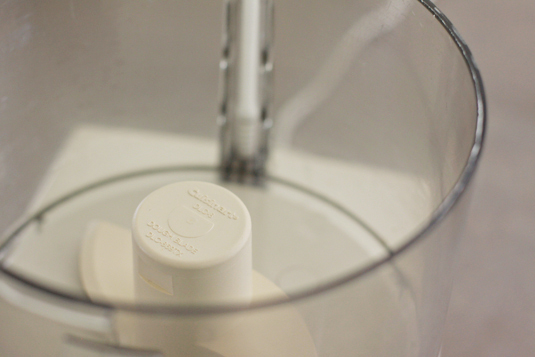 Add flour and salt to food processor fitted with dough blade. Pulse once or twice to combine. 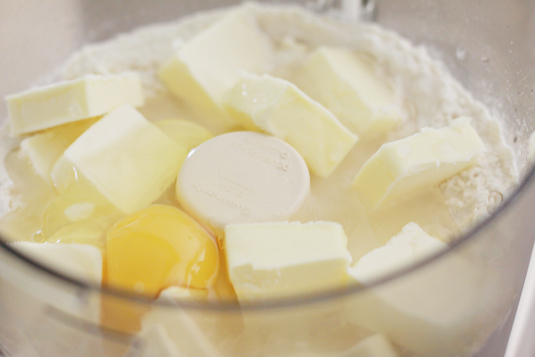 Add in butter, egg and water. Pulse until crumbly. Pat together into a ball and wrap in parchment or plastic wrap. Let rest in the refrigerator for 30 minutes or so. 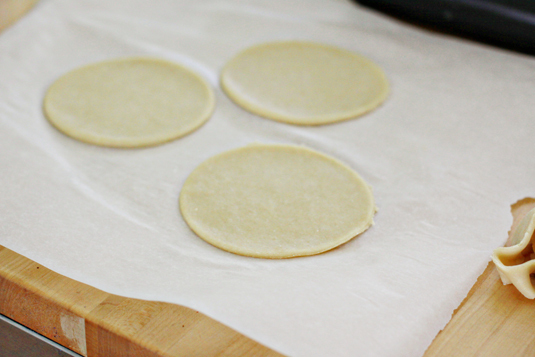 Roll out dough and cut out circles for empanadas and pies or desired size. Fill with desired filling. Fold in half and pinch at seams. Roll seams in and press with fork to seal. 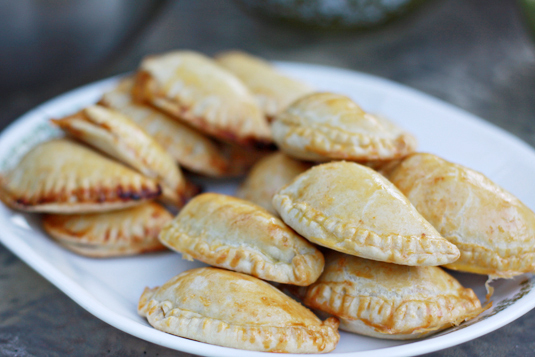 Beat egg yolk and brush over tops of empanadas. 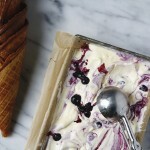 Allow to rest in fridge for 30 minutes before baking to prevent leaks. 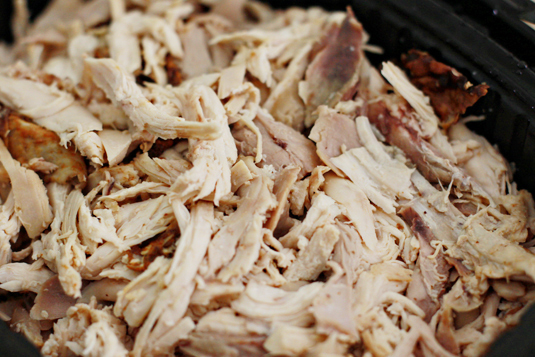 Bake at 400º F for 20-25 minutes until golden brown. Makes 20 small or 10 large empanadas. 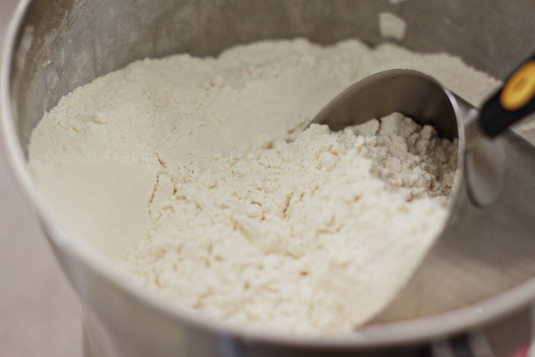 Fill empanada dough with 2-3 tablespoons of mixture for small and 1/4 cup mixture for large empanadas. 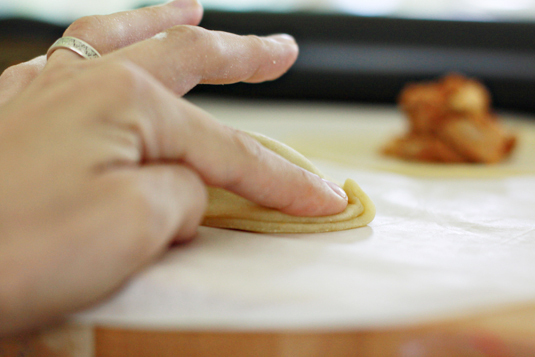 Follow empanada dough directions for baking. 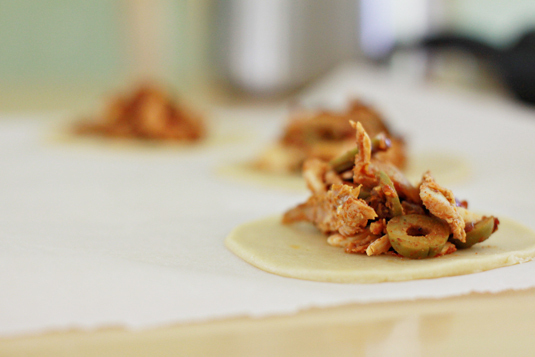 Note: Leftover filling makes wonderful quesadillas tomorrow. Makes filling for 16-20 small or 10 large empanadas. I love this post…well not the saying goodbye part, but I love the incorporation of your friends into your pictures. So lovely and the empanadas look delicious! I left a comment this morning…it seems do have disappeared. I gotta say, though, these are looking even better now than they were at 7am. I’m thinking midnight snack? I know a few late night bloggers who could make a pile of these empanadas disappear pretty fast. 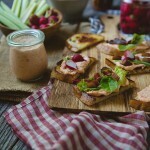 Such a lovely post, from the ever-so-appealing food photos to the cooking-out-with-friends. I’m sorry your friends are moving—it’s always hard when that happens. Perhaps, if things work out as they should, you’ll get to travel and your bonds of friendship will only grow stronger with the miles between you! Best empanadas I’ve ever had. We miss you guys! These look very tasty. I’ve yet to try Empanadas (a travesty here in Texas) but I will definitely print out your recipe and give it a whirl soon. 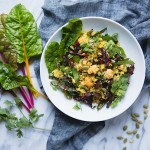 You have a lovely food blog, by the way! Love this idea. I’ve never made them – or any pocket item like that. It definitely seems pretty easy so I’m going to give it a try sometime when I have the right ingredients. Was just surfing the net and found your blog. I am going to make my empanadas also after seeing this post. 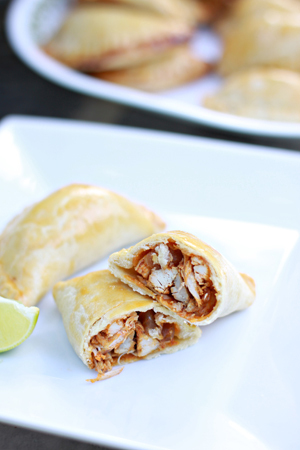 Just tried to make these Chicken Empanadas. Have to admit it was fun making them, but now I’m waiting to see how they will taste. It seems they are going to be absolutely delicious! 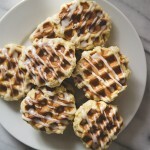 So i made these tonite and even though i used store bought dough they were really yummy! 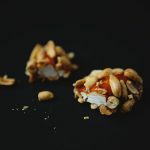 my husband loved them and i’ll make them again! What dough did you use and how much? Was it a pack of pie crust? 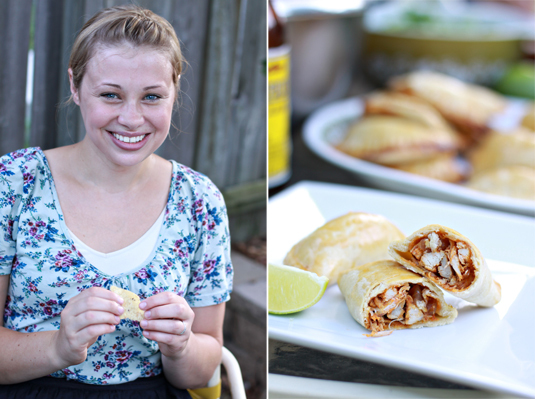 These empanadas look wonderful and I will definitely give them a try! One question: I will probably have leftovers…what is the best way to go about this? I’d rather not cut the recipe in 1/2, as I like to have leftovers the next day. Should I make the empanadas we won’t eat to the point of baking and then just refrigerate until the next day? 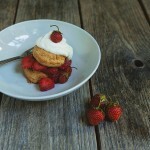 Or, should I bake them all and refrigerate the leftovers…? I know this is a late reply but for anyone else who reads this in the future, empanadas are fantastic when baked or fried and then frozen after they cool They warm up very well out of the freezer. I can’t give an exact longevity on them but I’ve never had to worry about it as they don’t last long enough in my house to be have to think about it, even when frozen. Just bake at 400 for about 8 minutes or until done to desired crispiness. . These empanadas were absolutely delicious! Will definitely be using this recipe from now on.